Chef Levi Carter spent his childhood being shuttled among family members in Vermont and St. Croix in the U.S. Virgin Islands. A similarly varied experience characterizes his culinary career, which began at the Vermont Pub & Brewery and took him to the New England Culinary Institute for a degree, then to A Single Pebble. Later, Carter returned to all-American spots such as Shelburne Steakhouse and the Clover House. His work at the new Lighthouse Restaurant and Lounge in Colchester reflects the diversity of his path: There Carter prepares seafood and Asian cuisines, steaks and down-home comfort food. To say that there’s something for everyone on the menu is an understatement. And offering something for everyone is clearly the goal of the new restaurant that’s taken over the former T Bones space adjacent to the Colchester Hampton Inn. It has plenty of seats to be filled: 180 currently, and more than 200 in the summer when an outdoor deck opens. That’s far more than Carter and the Lighthouse’s owner, Doug Simms, could serve at the Clover House, which they left for the larger space at the end of 2012. So far, the popular team appears to be succeeding at keeping the space hopping. On a recent Saturday night, the restaurant was full of jovial diners rocking out to the sounds of lounge act Rick Guest. The following Tuesday was also busy, with lines of people making their way through the 60-item salad bar. It could almost have been a flashback to the 1980s, pre-T Bones, when another restaurant called the Lighthouse thrived in the venue. Welcome as they are, crowds can also pose difficulties for new restaurants, and the Lighthouse hasn’t escaped the almost inevitable. A month and a half after its opening, I encountered some rough waves. On my first visit, it took 20 minutes for a waitress to ask for my drink order. Much of the food tended toward the overcooked. But, like the dove that returned to Noah as he approached the shore, plenty of better omens promised that the Lighthouse can become what its staff envisions. All entrées come with a choice of soup or salad bar, which explains the sometimes-startling prices. Figure in a crock of soup ($6 à la carte) or a trip to the salad bar ($7), and that $18 meatloaf is actually only $11 or $12. Though I knew those enhanced entrées would fill me up fast, I was still enticed to try the garlic-chicken-and-green-chile nachos. The nearly six-inch-high construction looked forbidding, but, once dismantled, the pile of warm tortilla chips proved to be nicely covered with cheddar, pico de gallo, jalapeños and olives. The sour cream mentioned on the menu was missing but not missed. I was too busy enjoying the garlic marinade flavoring the cubes of chicken, combined with tangy green chiles. Though the nachos were full of character, the salad bar largely lacked it. I was impressed by Carter’s homemade dressings (including a beautifully balanced honey-chile vinaigrette) during his brief tenure at Shelburne Steakhouse. At the Lighthouse, some homemade dressings were offered, but others came from big-brand Ken’s Foods. Most toppings, similarly, were out-of-the-box bacon bits, Chinese noodles and the like. Though the greens on the bar were fresh, many other veggies were less so. Even homemade salads, such as a bland peanut-noodle dish, appeared tired and included poorly chopped ingredients. One scallion in the aforementioned salad was three inches long. Soups were a better choice. Dark, beefy French onion benefited from a crackling crust of three cheeses and plenty of bread to soak up the broth. Cheddar-ale was made with a combination of Switchback Brewing Company ale and Cabot extra-sharp cheddar. Insufficiently blended onions messed with the creamy texture but drove home the fact that the comforting soup was indeed homemade. I’d heard a lot of buzz about the Hot Buttered Lobster Risotto, so it was a clear choice for my first trip to the Lighthouse. Unless you’re at a Cipriani, restaurant risotto can be an iffy proposition. Even more so at a steakhouse in Colchester, Vt. But Carter acquitted himself with style. The rice had just enough al dente bite, and a bit of mascarpone made it extra creamy, if a little less nutty than a straight Parmesan version. But, hey, it was filled with chunks of lobster. Who could complain? A good-size lobster tail rested on top of the rice dish, too. Poached in beurre blanc, the shellfish was cooked perfectly. A lemon on the side added a bit of acid, but I wish the dish had already contained that element, besides a smattering of cherry tomatoes surrounding the rice. I felt the same way about the bland Béarnaise sauce that I ordered on the side with my chateau bistro steak. That was missing not only acid but the tarragon needed to distinguish it from a Hollandaise. I selected the make-your-own dinner option, which includes a choice of protein and side, along with a trip to the salad bar and the vegetable of the day. All sauces and enhancements are an extra $2. It’s a fun system, but that night, the results disappointed. The chateau bistro, better known as a shoulder tender, is an underutilized cut — the teres major muscle in the shoulder, as tender as filet mignon but significantly less expensive. Not only was my steak cooked beyond my requested medium-rare, it would have been overcooked for medium-well. The crusty outside was more burnt than pleasantly charred. Green beans and carrot sticks were also cooked within an inch of their lives. But the dried-out macaroni and cheese was the saddest part. The cavatappi was supposed to have been baked with a sauce of 2-year-old Grafton Village cheddar but appeared to have absorbed it. The only trace of flavor or moisture was in the oasis of buttery Ritz-cracker topping. On my next visit, I was hoping to have barbecue beef ribs, but our server told us the chef had nixed them when he couldn’t find sufficiently meaty specimens. Respect for not serving a product that wasn’t up to par. I elected to try another barbecue dish instead, the bone-in pork chop. My server asked how I wanted it cooked, and I requested “just past pink.” The result was closer to “just before incineration.” Once again, the outside was blackened, the inside long minutes past pink. Luckily, the chop’s dried-cherry-bourbon demi-glâce enlivened the desiccated pork. So did a base of ultra-buttery sweet-potato mash. And this time, the beans and carrots retained a welcome hint of crunch. But the best thing that I ate at the Lighthouse was the most unexpected. 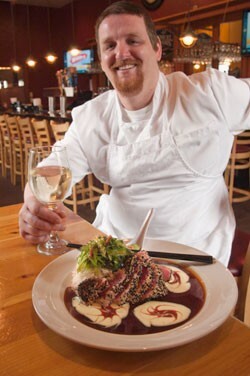 When my server asked how I wanted my sesame-seared yellowfin tuna cooked, I got nervous. If a raw-inside presentation wasn’t the default, could the fish be served that way? Still, I answered “seared,” and got just that. Two good-size slices of tuna were perfectly pink inside and enticingly seared in a sesame crust. The fish was sandwiched between piles of perfectly cooked, aromatic jasmine rice and chewy, sesame-dressed wakame. Drizzles of sweet soy-ginger glaze and creamy wasabi aioli enhanced the already spot-on flavors. Served in an Asian-style spoon, a few slices of pickled ginger added a little more flair, though the ball of wasabi was too claylike to use. Despite the emphasis on steak and seafood at the Lighthouse, I was impressed to find a couple of good options for vegetarians who don’t want to be stuck with the salad bar. My friend’s order of portobello-mushroom ravioli was a little soft for my taste, but its indulgent Marsala wine sauce and zigzags of sweet-and-sour balsamic reduction were delicious, especially when they soaked into the spinach and tiny mushrooms served with the pasta. Rather than try several big desserts, we sampled three mini ones as part of a special chocolate trio. Our only choice that appeared on the regular menu, the homemade Chambord chocolate mousse, was a bit of a disappointment. While chocolatey, it was distinctly grainy in texture. A buttercream-filled ring of red velvet cake and another round of white, milk and dark chocolate mousses — both supplied by Annie’s Bakery of Sodexo — were just as flavorful, but smoother and easier to eat. At this point in the Lighthouse’s life, most of the problems I experienced could easily be chalked up to growing pains. As Carter gets more accustomed to managing a kitchen of this size, he’ll be better able to ensure that everything leaving it is up to his standards. I’ve enjoyed enough of Carter’s food at other restaurants to be confident in his skills and hopeful that homemade foods will soon replace the Sodexo-supplied dressings and desserts. Whether he’s drawing dinner inspirations from the islands or the mountains, this chef’s home cooking is a constant I can stand behind. The Lighthouse Restaurant and Lounge, 38 Lower Mountain View Drive, Colchester, 448-3361. The print version of the article was headlined "Sailing Home".